Most of the required technology is available and the costs are decreasing year after year for microgrid networks. But what are the main barriers to even speedier adoption? Mainly two: creating adequate regulatory frameworks and attracting sufficient capital, explains Arnaud Henin of Gommyr Power Networks. There is an inexorable shift taking place in the power sector. New technologies, including improved renewable generation technologies, batteries and energy storage, big data analytics, the Internet of Things and enhanced automation and control, are gradually permeating into the power sector. Momentum is building as more and more businesses and consumers adopt these technologies, new and improved products become available and growing scale pushes down costs. Both new start-ups and disruptive technology companies are challenging the traditional power utility business model of one-way power provision, with the “prosumer” model gaining recognition. Gradually but with increased momentum, centralized conventional fossil fuel power generation is being replaced with localized renewable power networks. Microgrids — meaning local power networks incorporate energy demand, supply, control and storage — will be nodes in this power network. These microgrids will aggregate local renewable distributed generation, incorporate energy storage, community generation assets (such as larger scale renewable, CHP and back-up storage and generation) as well as local energy efficiency and demand response measures. 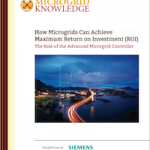 Microgrids will incorporate information technologies to collect and analyze data in real-time and optimize the system for cost, reliability and environmental performance. They will be able to provide power, store energy and reduce demand as needed. Microgrids will ensure that electric vehicles can be charged with only renewable power. They will ensure power to critical services at critical times, such as during natural disasters, when often the availability of centralized power supply becomes uncertain. It is not by chance that one of the first public calls for microgrid development came in Connecticut after the grid failed following hurricane Sandy in 2012. All of the above will be delivered at costs competitive with current grid-supplied power. This shift will also help towards empowering communities, businesses and individuals by giving more information and control over their energy needs and breaking the dependence on external fossil fuel supply. It will allow new local revenue streams and jobs linked to selling electricity and maintaining local equipment to be created and a whole set of new economic activity to develop around this. In emerging markets, it will help economic development by allowing countries and communities that even today do not have access to the grid to leapfrog a conventional centralized fossil-fuel power grid and build scalable local renewable microgrids. Money that would have been spent on costly grid infrastructure can be invested in electrifying communities and providing power for growth. Renewable microgrids are a rare example of a technology that aligns the interests of sustainability and economic growth. Achieving this transformative shift in the power sector as quickly a possible will yield tremendous economic and environmental benefits. Governments, communities and companies are seeing the opportunity and beginning to move forward. Indeed most of the required technology is available and the costs are decreasing year after year. But what are the main barriers of even speedier adoption? Mainly two: creating adequate regulatory frameworks and attracting sufficient capital. Regulatory and legal framework for transforming the power sector should incentivize innovation and address vested interests whilst protecting against stranded energy assets. This will also help create the long term certainty necessary to attract the large amounts of capital needed to make the upfront investments in renewable generation and energy storage assets. 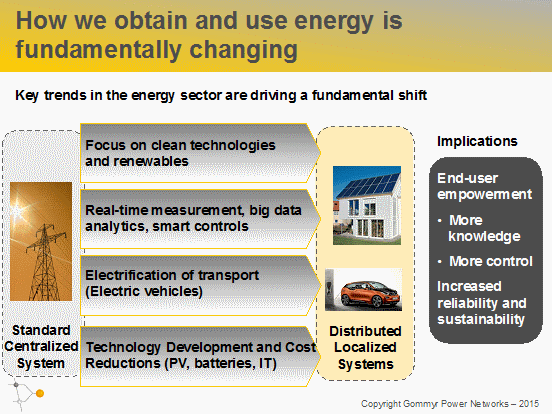 The future role of utilities in a new localized energy world is uncertain. Utilities have huge investments in conventional power supply and strong relationships with end-customers and so many utilities will see this shift as a risk. However, this shift will take decades to fully take place and require tremendous amounts of capital. With strong balance sheets, access to capital at competitive rates, deep sector knowledge and long-term relationships with regulators and customers, utilities companies are well placed to play a leading role in the transformation. Indeed some such companies, such as E.On and RWE in Europe, are already reorganizing their companies and their assets in preparation for this shift. Overall, this power sector transformation is exciting for the benefits it will bring to local communities and the fight against climate change. Communities, governments and companies all have the opportunity to take part in this shift and capture some of the benefits. The need is clear, the technology is available and customers are ready. The critical factor remaining will be securing the large amounts of money required for these investments — but if governments and regulators create the right framework, it’s certain the required capital will be found and the transformation will continue. Soon or later, gravity power will come to stay.